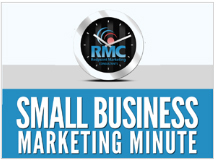 In today’s episode of the Small Business Marketing Minute show, I teach you about “contact marketing”, which is a term coined by Wall Street Journal cartoonist Stu Heinecke, who recently wrote a book called How to Get a Meeting With Anyone. Contact marketing is all about connecting with someone who could transform your business. This could be a major client, an influential strategic partner, or a famous mentor. Listen to the episode using the player below to find out when you should use this type of marketing and get some ideas you could use in your own contact marketing campaign.